Q: What kind of woods are propellers made from? A: The preferred wood seems to be Birch but some builders use Maple, Mahogany, Walnut and other woods. The wood should be kiln dried and straight grained without any knots. Q: Where can this wood be obtained? A: Look in the yellow pages for hardwood dealers. Hardwood is not usually sold at a lumber yard. There is a market for quality hardwoods for furniture use, and you should be able to fine good hardwood in any city. Q: What kind of glue is used? A: A high quality water proof glue. The preferred glue seems to be Resorcinol. Q: How do I get a pattern to copy in the duplicator? 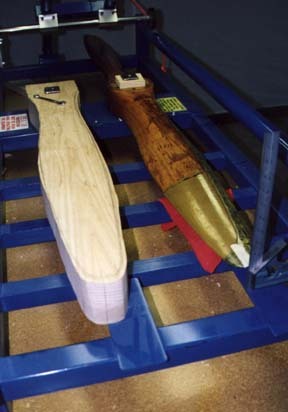 A: The easiest way is to copy an existing wooden propeller *. This propeller can be a damaged one as long as there is one good blade to copy. The second method is to copy an existing propeller and create a template that can be modified to create a new design. 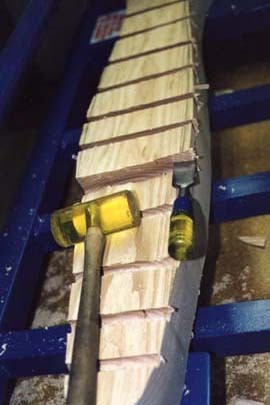 The third way is to hand carve a template from a known design (see Eric Clutton's book Propeller Making for the Amateur). 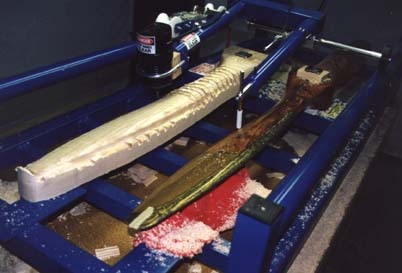 This is less difficult because you can use a soft wood and you only need to carve one blade. Also, any mistakes or subsequent changes can be accomplished through the use of fiberglass and Bondo, due to the fact that this is not an airworthy propeller. * Do not duplicate the profile of a metal propeller in wood, as the section thickness of an aluminum propeller is not sufficient for structural integrity in wood. 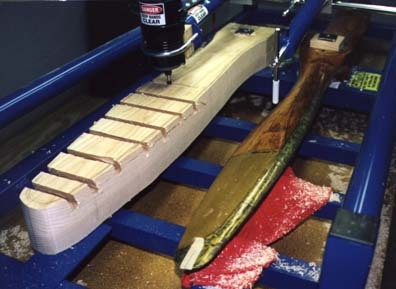 Below are a number of pictures of the Gemini propeller duplicator in action. 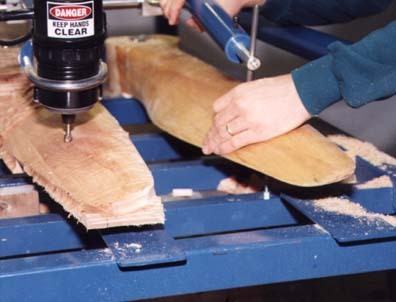 The first five pictures are showing the basic steps of carving a propeller. 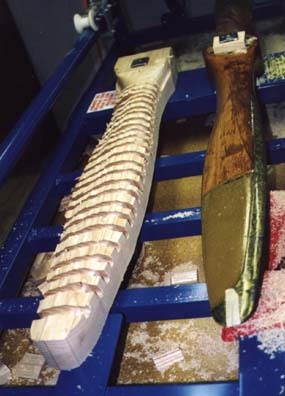 In this case, we are making a single blade template from an existing propeller. A close-up of the finish cut. For additional information see The Prop. Carver's Store for books and videos. Experimenter, November 1987 Vol.? No.? You may need to set the reduction on your computer when you print these articles. On Windows: Size of needed reduction will vary based on printer resolution. On Macintosh: Go to File:Page Setup, set Reduce/Enlarge to 70%. Allred & Associates would like to thank EAA Publications for graciously providing permission to reprint these articles.